A view of the small town of Vama. 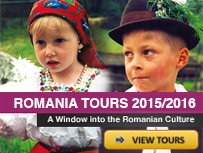 Bucovina is one of the most attractive and visited touristic areas in Romania. No wonder this area(famous today all over the world) was given in 1975 the Pomme d’Or international prize by The International Federation of Travel Writers and Tourism Journalists. The century-old architecture monuments together with the frescos from this country spot were listed by UNESCO among all the universal art monuments. Keeper of ancient civilization, where history and legend merge together, Suceava district holds evidences of man’s presence from ancient times.The 96 incineration tombs found out at Zvoristea, as well as the archaeological discoveries in Silistea Scheii, Suceava , Bosanci and Dolhestii Mari, prove that Thracian –Geta and Dacian settlements existed there a long time ago. 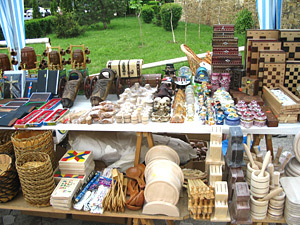 The lands of Suceava represented the places where Moldavia became an independent and feudal state in the 14th century. 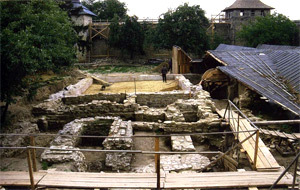 Locations such as Baia, Siret, Suceava, Radauti still keep edifices (fortresses, church foundations, princely homes) dating the time of the first Moldavian voivods. Other localities, such as Putna, became a strong manifestation for Romanian people’s sense for an united nation. To this common sense many important persons contributed: Mihai Eminescu, Mihai Slavici, Ciprian Porumbescu and some other young people that came here all over Romanian lands. This fact strongly expresses the active role the people from these lands have played along the history. Click on the map for a full resolution Road Map. 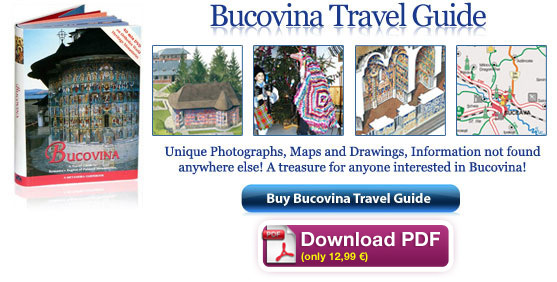 Bucovina is known for its folk costumes, furniture, pottery, tapestries and carpets. The craftsmen continue the traditions handed down from generation to generation. 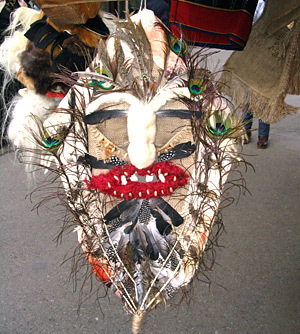 Masks, traditional costumes, painted eggs, carved wooden objects, embroideries and carpets are still part of daily life. Woodworking is much appreciated in Bucovina, where the material is plentiful. It is used for most household objects, as well as building the houses. The different parts of the house are decorated with carvings, such as the pillars of the veranda or the farmyard gate. The dowry includes, apart from the trousseau of textiles, also carved wooden cups, spoons, barrels, ladles and pots. An ancient occupation in the zone is the making of pottery. 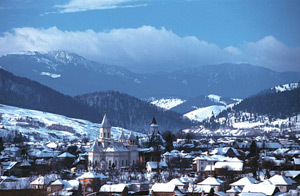 There are two well-known centers of workshops, Rădăuţi and Marginea, but also Boroaia and Dolheşti are worth a mention. The potters of the Magopăţ family in Marginea and those of the Colibaba family in Rădăuţi are famous everywhere for their skills. Bucovina is one of the few regions where the tradition of painted Easter eggs is still alive. The biggest and hardest eggs are turned into real masterpieces of intricate patterns in green, red, blue, black and yellow. In Brodina, Izvoarele Sucevei, Suceviţa, Breaza, Moldova Suliţa and Ulma egg painting is one of the main occupations of women. The offer of accommodation is varied and there is something for the budget of every traveler. There are modern luxurious hotels fulfilling Western standards, tall concrete blocks dating from the communist period, old-fashioned pensions, new villas and casas, which are small private hotels, and rooms in a farmhouse. The architecture in Bucovina, as well as in all of Romania, is a mix of old and new architecture, but very often hotels are found in anonymous modern buildings. All hotels are classified according to a national system, going from one to five stars. Anyone wanting to experience the region first-hand and eager to see how a Bucovinean household is, should stay at a farmhouse in what the Romanians call agroturism. One can find sings of cazare (rooms) in any of the villages near the monasteries. These are normal homes with some rooms that are rented out. The rooms are warm and clean, but often not equipped with any extra comfort, such as private bathrooms. Upon request, the owners can prepare dinner. The prices are very low, but change according to the season in the most popular villages. With less than 10 €/day one can have board and lodging in interesting surroundings. To see local life one can also opt to stay in a pension. A pension is usually a slightly bigger house, with the owners living in one part of it, and in another part several guestrooms that are rented out. The rooms are often equipped with a bathroom, phone and TV. Also here the owner can prepare dinner, if needed. Staying in a pension means that one can become quite involved in the life of the owner and his family, especially if the stay is long. Usually pensions are found in small towns or villages that are difficult to reach by public transportation, and are perhaps more suitable for those who travel by car. The accommodation prices for a pension are much lower than for a hotel. A room can cost between 10 and 15 €/night/person. For the meals another 5 €/day/person should be enough. The old hotels built in the 1970’s or 80’s usually have two stars. 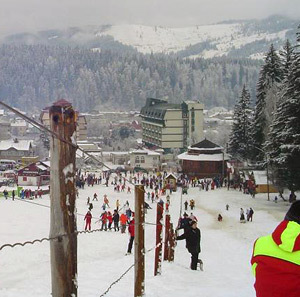 In Suceava there are the Bucovina Severin, Continental (Arcaşul), Suceava and Balada hotels right in the centre of the town. 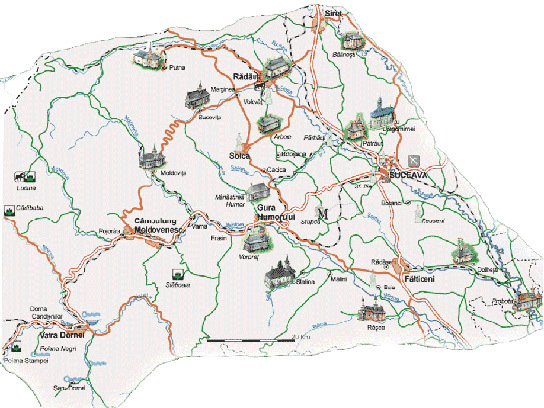 In Câmpulung Moldovenesc can be found the Zimbru and Carpaţi hotels, in Fălticeni the hotel Turist, and in Vatra Dornei the Călimani and Dorna hotels. All these are near the centre, but quite anonymous compared with the newer private hotels. The price per night varies between 10 euro and 50 euro including breakfast, depending on the comfort and the number of beds in the room. The “casas” or “vilas” are mostly modern houses on two levels, with their own heating system, restaurant and good quality service. They are graded from two to four stars, and the price is directly proportional to the services they offer. The best ones can have a sauna, swimming pool, bar, common room with a fireplace or a library. The prices range from 30 € to 50 € per night. All have a restaurant and offer good food. This private hotel has two buildings. One is a two star hotel with a pizzeria at the ground floor, and the other one is a three star hotel with single or double bedrooms. They charge medium prices and provide good service for their clients. For a single room the price is about 23 €/night; for a double room 26 €. This is a private hotel downhill from the Monastery of St. John the New. Air conditioning, central heating, bathroom with tub and shower, phone, cable TV, internet connection and mini-bar is in every room. Breakfast is included in the price of the accommodation. There is a restaurant with European and Romanian cuisine. The hotel is placed near the centre, and has 100 single and double rooms and four apartments. The hotel used to be called Arcasul, but had a facelift when the Continental chain bought it. The rooms have either a bathtub or a shower, central heating, cable TV, phone and internet connection in every room. There is a restaurant. Placed in the centre of the town, the hotel has been partly renovated and modernized. It has 78 double, 8 single and 2 triple rooms as well as 6 suites. Every room has its own bathroom with bathtub or shower, cable TV and direct international telephone line. The first class restaurant serves Bucovinean dishes. Best Western Bucovina is a newly built hotel that has 130 rooms (84 double rooms, 38 single rooms, 4 junior suites, 2 VIP suites and 2 VIP rooms) overlooking the mountains. The rooms are furnished with new gothic-style furniture; there is cable TV, internet connection and mini-bar in every room. The elegantly furnished restaurant serves local and international dishes, and there is a bar and an outdoor terrace. The hotel has equipped conference rooms, room service, a guarded parking lot, a tourist information kiosk, a boutique and a fitness centre with sauna, Jacuzzi and massage. This modern private hotel has 14 rooms arranged in suites with a single or a double bedroom and a dining room. Each apartment occupies an entire floor and is furnished in a different style (Romanian, Swedish, French or German). The rooms have cable TV, video, radio, mini-bar, and an international telephone line. The hotel is equipped with a fitness room, a Finnish sauna, a library with numismatic and stamp collections, an music room with a Yamaha concerto piano, a breakfast room, a dining room and a luncheon room. To get in one needs a recommendation. The villa offers comfortable accommodation in 15 single and double rooms, four bathrooms (one with bathtub, two with showers and one small toilet), a small bar, a Finnish sauna, a modern kitchen, a living room, a study, and a yard with an open-air swimming pool. The villa has its own central heating to assure continuous hot water. Every room has cable TV. The hotel offers full board, transportation to/from Salcea airport or any train station in the area and rent-a-car. Placed at the beginning of the long Voroneţ village, this small hotel is well placed to visit Voroneţ, Humor, Suceviţa or Putna monasteries. There are 18 double rooms and 4 apartments in four buildings. Every room has a bathroom with hot water, cable TV and room service. The hotel has a first class restaurant with a terrace, a conference room, a living room with fireplace and bar, a billiard room, a sauna, playgrounds for the children, and a parking space. Upon request can be organized festive dinners, business meetings, conferences and campfires. This chalet offers accommodation in 10 double rooms, 3 luxury double rooms, 4 suites and 4 honeymoon suites with bathrooms and international telephone lines. There is a covered swimming pool, a sauna, a sports ground, a conference room, a living room with fireplace, a restaurant, a wine cellar, an open-air restaurant on a terrace and a barbeque. There is a ski slope very close to the villa. Casa Lucreţia offers 22 places in 11 large rooms and upon request, full board with traditional Bucovinean cuisine. There is a dining room, a living room with a fireplace, modern bathrooms, a kitchen at the disposal of the guests and a swimming pool. Upon demand they can arrange for transportation to and from the airport or train station, organize trips to the monasteries and other touring sites, or even mountain trips. In cooperation with the Hunters’ Association can be arranged hunting parties. The 3 apartments and the 12 double rooms have their own bathrooms, TVs, international telephone lines and mini-bars. The restaurant with an open-air terrace offers traditional Bucovinean and international dishes. There is a fitness and massage room, sauna, solarium and swimming pool. 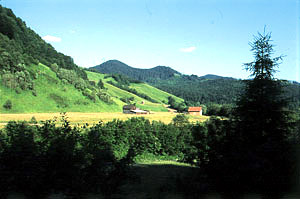 Not far is the hunting cabin “Eden”, and hunting trips can be arranged on the Rarău mountain. There are 82 beds in cottages with either three or four star comfort, as well as a camping site. There is a restaurant with an open-air terrace. The rooms have TVs and international phone lines. The hotel can arrange visits to museums, local farms, and workshops of handicrafts. They also organize horse rides in winter, tennis games, archery, receptions, festive meals, business meetings, traditional folkloric dinners, fireworks and picnics. In the winter one can ski on a nearby ski slope with a ski lift. The private chalet has 17 beds in 5 double rooms, 2 honeymoon suites, and a room with 3 beds. Every room has its own bathroom, cable TV, radio and an international telephone line. The small restaurant has reasonable prices. I JUST WANNA BE HERE TOOOO MUCH…!